The sun was about to rise on Farmer Tim's farm. Chester Chicken woke up the cows with his important news. "The chickens are taking a holiday today," Chester Chicken said. "Is that so?" said Daisy the cow. "What is the special occasion?" "We worked too hard this week," Chester said. "Yes! We laid ten eggs this week," Chester said, "and there are only five of us." Daisy smiled and nodded her head. Ten was a lot of eggs for five chickens. "Enjoy your day off," she said. "But what about us?" the other cows said to Daisy. "We gave Farmer Tim 100 pails of milk this week. There are only ten of us!" Daisy agreed with the cows too. 100 pails of milk would make a lot of cheese. "But we can't take a holiday on the same day as the chickens," Daisy said. "What would Farmer Tim say?" Daisy and the cows moved over to a patch of grass to have their breakfast. "The chickens are taking a holiday," Daisy told the trees. "And we don't think it's fair." The trees were not happy with this news. "I've dropped over 1,000 apples this season," one said. "And I've had a million cherries picked!" said another. The wind blew and the trees put on their angry faces. "We deserve a holiday more than the chickens!" the trees shouted together. "We worked too hard all season." This woke up the rake that was sitting on the grass underneath the trees. "Have you heard the news?" the apple tree asked the rake. "The chickens are taking a holiday. They think they worked too hard this week." The rake stood up and announced its disapproval. "I raked over one million leaves this year. And there's only one of me! If anyone deserves a holiday it is a poor tired rake." Just then Rowdy Rooster hopped on the fence. He looked up into the sky and began to crow. It was time for the farmer to wake up. 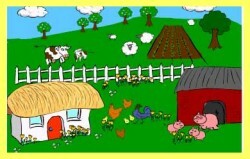 The chickens and cows and trees waited for Farmer Tim to come out and pick up the rake. But a minute passed and Farmer Tim did not appear. Rowdy called two more times. "Call him again," the chickens yelled to the rooster. "He must be having a dream." "I worked too hard this week, I say. It's time I took a holiday!"